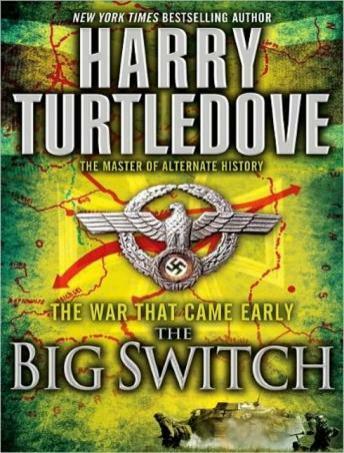 In this extraordinary World War II alternate history, master storyteller Harry Turtledove begins with a big switch: what if Neville Chamberlain, instead of appeasing Hitler, had stood up to him in 1938? Enraged, Hitler reacts by lashing out at the West, promising his soldiers that they will reach Paris by the new year. They don't. Three years later, his genocidal apparatus not fully in place, Hitler has barely survived a coup, while Jews cling to survival. But England and France wonder whether the war is still worthwhile. Weaving together a cast of characters that ranges from a brawling American fighter in the Abraham Lincoln Brigade in Spain to a woman who has seen Hitler's evil face-to-face, Harry Turtledove takes us into a world shaping up very differently in 1941. The Germans and their Polish allies have slammed into the gut of the Soviet Union in the west, while Japan pummels away in the east. In trench warfare in France, French and Czech fighters are outmanned but not outfought by their Nazi enemy. Then the stalemate is shattered. In England, Winston Churchill dies in an apparent accident, and the gray men who walk behind his funeral cortege wonder who their real enemy is. The USSR, fighting for its life, makes peace with Japan-and Japan's war with America is about to begin.